You're one stroke up on Tiger Woods on the last hole of the PGA Championship. Tiger led this tournament from the start, and what's more is: he's never lost a major championship when leading after three rounds. Albeit that you are in the fairway, you still have 210 yards left to the green and you have a cluster of huge trees in between you and the green. All you have to do is make a birdie and you will certainly win your first major, and everything you've ever dreamed of will come true. What do you do? I would puke all over my Foot Joys. 37-year-old South Korean Y.E. Yang took out his trusty TaylorMade Rescue TP Hybrid and hit the shot of his life: a high-cut shot that just cleared the tops of the trees and then settled down on the green like it had been struck by a pitching wedge. The six-foot putt was just a formality as Y.E. Yang shocked the world, winning the 2009 PGA Championship. Let's talk about this club. This TaylorMade TP Hybrid is a sweet-looking club. The head is sleeker than most hybrids, designed for the workability of an iron. 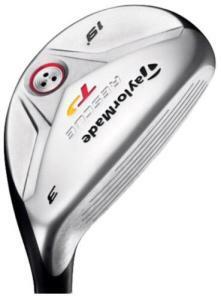 However the steel pull-face construction with its high COR promotes faster ball speed and more distance. This is a beautiful club. It is just aesthetically pleasing to look down at address with the entire black head and steel face. The club has a nice feel and is easy to swing. That being said, this is a player's club designed for low handicappers. Its repositioned COG is designed for low penetrating shots, not like other hybrids that will help less consistent players to get the ball up in the air quickly. If you are looking for a more forgiving club, check out the Nickent Golf 3DX RC Hybrid Iron.